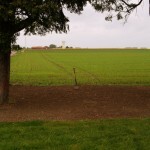 A view of the memorial site from the direction of Violaines. 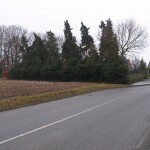 Fir trees and a thick hedge mar any view of the field containing the Red Dragon crater and Shaftesbury Shaft. 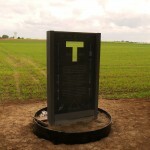 The site also contains the 55th (West Lancashire) Division memorial – a tribute to their tenacious defence of the village in spring 1918. Scrub covers much of the site. 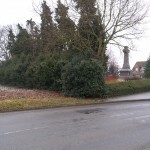 The memorial is to sit between the trees in centre of frame. 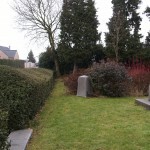 The site after clearance work by the CWGC – an amazing transformation. The shovel marks the proposed site of the memorial. 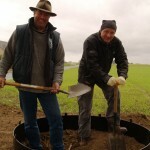 Peter Barton and Gary Andrews begin digging the foundation for the base. 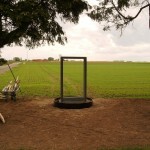 The circular base and memorial bottom ready for the addition of concrete. Peter and Gary add the necessary concrete to stabilise the memorial footing. 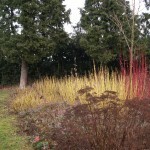 The horizontal piece completes the outer ‘frame’ representing the timber ‘sett’. The front panel is slid into place. 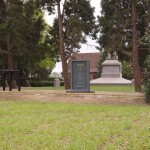 The memorial, as seen from the rear. Clear evidence of the extensive site landscaping by CWGC workers is evident. 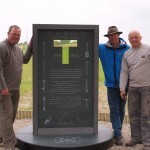 Iain McHenry, Gary Andrews and two local helpers next to the near-completed memorial. 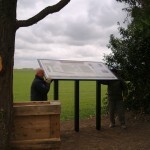 Gary and Iain carry the information panel into place. 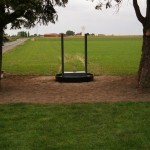 The site begins to take shape – memorial and information panel are now in place. 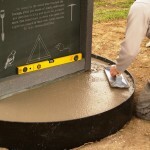 The base is concreted and levelled. 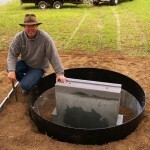 The circular base panels are put in place. 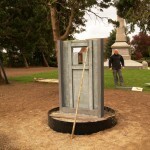 Peter and Gary complete the tricky process of adding the base panels. Black mastic sealant completes the operation and pea shingle is spread around the site. 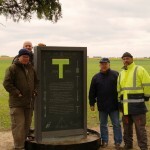 The construction team of Iain McHenry, Peter Barton and Gary Andrews stand proudly by the completed Tunnellers Memorial. 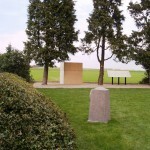 A view from the field – Tunnellers Memorial and information panel sit easily alongside the 55th (West Lancashire) Division memorial. 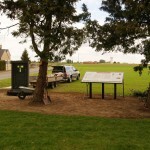 Memorial and information panel are boxed up ready for 19 June and the unveiling ceremony.